The Yokohama Minato Mirai area, with its shopping malls and sightseeing attractions, offers many places to visit. 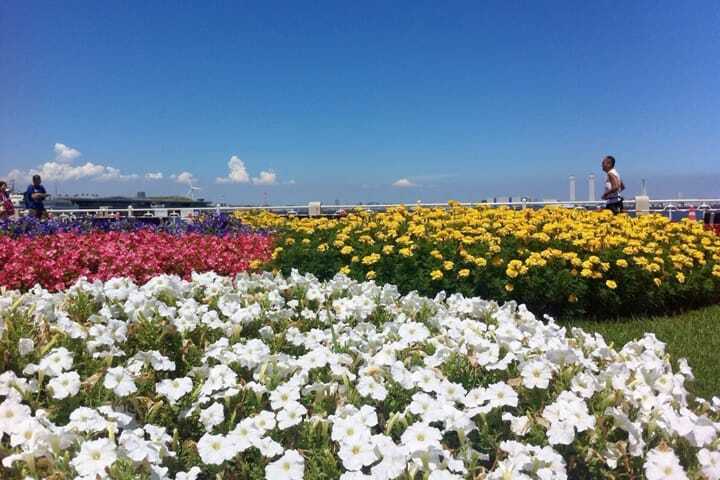 Take a few minutes' walk from Minato Mirai, and you'll find Yamashita Park, where the breeze from the Yokohama port can be felt. It's the most famous park in Yokohama, and perfect for sightseeing, or as a place to go out on a date. Yamashita Park has an interesting history. It was built as a part of a reconstruction project, after the Tokyo Earthquake in 1923. The construction was completed in 1930, using the rubble left by the earthquake for the landfill. In 1989, as a part of the Yokohama Exotic Showcase exposition, celebrating the 130th anniversary of the Yokohama port opening, parking lots and public squares were added to the park. In some areas, you can still feel the festive atmosphere. The view of the Minato Mirai area from the park is beautiful, and you can also see the Osanbashi Yokohama International Passenger Terminal. On a clear day, a stroll in the park, feeling the sea breeze, is something special. Thanks to the number of benches in the park, you can leisurely enjoy the view of the Yokohama port. In the center, there is a grass plot, where people enjoy sunbathing or reading a book. You can also visit the Hikawa Maru of the NYK Lines, which rests on the east side of the park. The fee is 300 yen for adults, and 100 yen for the children under 18. There are many interesting monuments in the park, some of which were donated from abroad. This shows the international side of the Yamashita Park. This is "Sea Goddess," donated from San Diego, a sister city to Yokohama. The statue, surrounded by the fountains, has a heavenly atmosphere. This is a statue inspired by the Japanese nursery song, "Red Shoes," sitting modestly, facing the port. "The Indian Water Tower" is located on the western side of the park. The 1923 earthquake affected many Indian natives residing in Yokohama, and the survivors donated this monument in memory of their fellow Indians. There is a convenience store and a place to sit down near the monument, so you also can take a break here. "Seabass" (water bus), operating from the east entrance of the Yokohama Station, is another way to approach Yamashita Park, while enjoying the view of Yokohama from the boat. The fee for the 15 minute boat ride is 700 yen for adults, and 350 yen for children. After the sunset, the park becomes a popular place to enjoy the night view of the Minato Mirai area. The Yokohama scenery changes every hour, and with a stroll in Yamashita Park, you'll be able to enjoy it in full. Access: Three minutes' walk from Motomachi-Chukagai Station (Minatomirai Line). Five minutes' walk from Nihon-odori Station (Minatomirai Line).